Facebook has created a new iPhone app that informs you about things close to your heart right on your lock screen. Aptly called Notify, the app pushes notifications from sources that interest you on news, sports, celebrities, movies, shopping, music and more. Although its features are similar to those of a news reader, the Notify app technically isn’t one since it can alert you of non-news content too, such as new videos from Vevo. The new app does not display Facebook notifications, which recently got revamped with a card-style layout. Notify lets Facebook give you one more way to discover new and interesting content and keep yourself abreast of what’s fresh from a long list of notification sources that Facebook calls stations. These stations include content publishers such as ABC, Billboard, Bloomberg Business, BuzzFeed, CBS Sports, CNN, Comedy Central, Discovery, Fandango Movieclips, Getty Images, Groupon, History, Mashable, Time, Vogue, Washington Post and The Weather Channel. The app can suggest stations based on your Facebook profile. Visit the Notify app website to see a complete list of sources. 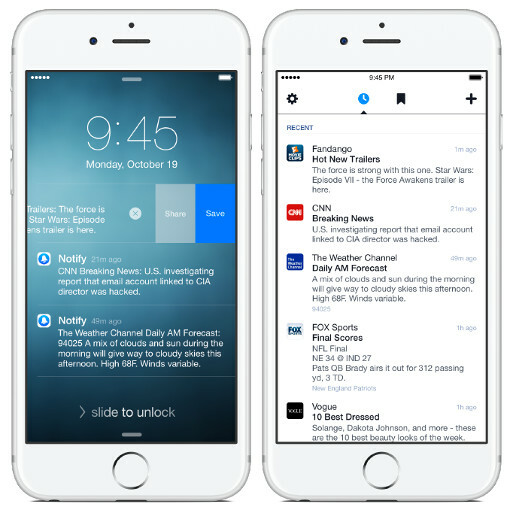 Like other notifications on your lock screen, Notify messages are short and to the point like headlines. To access the story or content, tap or swipe the notification to open the link in the browser. You can also save notifications to a list so you can get back to them later. Review all the notifications that have arrived in the last 24 hours by scanning the Recent feed within the app. Notifications are shareable with your friends via Facebook itself, SMS, email and other social media platforms, even without leaving the lock screen. To try Notify for Facebook, download and install the Notify app from the Apple App Store. Has Facebook become part of the way you keep up with your social circle and the world around you? Keep up with the latest ways to do that on our Facebook coverage page.